Ontario’s auditor general should investigate auto insurance rates after a new study found that Ontarians are being grossly over-charged. A new study showing Ontarians were likely over-charged for auto insurance by $840 million, in one year alone, is sufficient cause for a fresh investigation by the province’s auditor general. It’s no secret that Ontario residents are forced to pay a lot for auto insurance — we face rates that are 45 per cent higher than in Alberta, and about double what they are in the Maritimes. Hard-pressed consumers deserve more assurance that they aren’t being gouged. Having the auditor general’s office dig into every aspect of this situation would either restore public confidence in the existing system or expose problems sorely in need of reform. The office did examine auto insurance regulatory oversight in 2011, but an updated and deeper probe is in order. New concern over the fairness of the status quo was triggered last week by an analysis of the auto insurance industry done by two professors at York University’s Schulich School of Business, Fred Lazar and Eli Prisman. 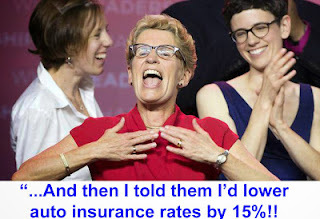 They concluded that Ontario consumers may have overpaid for auto insurance by as much as $4 billion between 2001 and 2013, with excess fees amounting to $840 million in 2013 alone...More. The OEB doesn’t issue a press release when your local distribution company increases their rates, part of the “total bill,” so that reference is meaningless. If you look at the actual price rise from November 1, 2014 to November 1, 2015 the increase is considerably more than 3.4%. In fact the increase on the charge for the “Electricity” line is 12.8% excluding the HST applied on that increase. The charge for electricity for the “household that consumes 800 kWh per month” increased by a total of $130.31, not the $53.04 that the OEB infers. Even using the “average” RPP (regulated price plan) posted on their site and comparing November 1, 2014 to November 1, 2015, you get an increase of 12.5%! Looking further that what’s in the OEB News Release, we find that they attribute the increase as follows: “Increased costs from Ontario Power Generation’s (OPG) nuclear and hydro-electric power plants make up about 40% of this increase. Costs from renewable generation sources are another driver, representing about one-third of the increase.” I emphasized the last sentence as it doesn’t reflect certain facts about renewable generation (principally wind and solar), including the need to pay OPG for spilled (unused) hydro power, payments to gas plants to idle (ensuring power is available when the wind dies down or the clouds cover the skies), or directions to complete marginal generation (Mattagami’s project cost was $2.6 billion) which produces power when it’s not needed, in the Spring and Fall periods when Ontario’s demand is low. Note: The Ontario Energy Board is a six-member regulatory body (four women and two men) headed by chairman Rosemarie T. Leclair. Although it is an arms-length organization, it almost invariably sides with government and/or energy suppliers. According to the 2013 Sunshine List, Leclair earns a $550,000 salary. Nothing is certain but death and taxes, and it seems that Premier Kathleen Wynne is managing to make both worse for Ontarians. On January 1, 2015, onerous new estate rules took effect in Ontario. When a person dies, their assets are managed by an estate representative. In most cases, that person is the grieving spouse or children. Ontario has the highest Estate Administration Tax (EAT) the country. The EAT was previously called a "probate fee," but in this rare instance of honesty the Ontario government has changed the name to reflect what it really is -- an estate tax. The EAT rate is currently $5 per thousand for the first $50,000 of an estate, and $15 for each $1,000 after that. So an estate valued at $240,000 would pay a $3,100 in EAT. A $1 million estate would pay an EAT of $14,500. In other provinces, the rate is a flat set amount, or does not exceed $7 per $1,000 compared to Ontario's $15. And of course, the EAT is paid on top of the taxes that Ontarians pay on the investments and assets they spend their whole lives working hard to acquire and leave to their children. Starting this past January, the rules around becoming an estate representative changed to create a great deal more work, and increased liability. Under the old rules, staff at the local court would assess and collect the Estate Administration Tax based on a sworn statement listing the deceased's assets and their value. Under the new rules, the tax is not collected at the court. Now, the representative must apply for the Certificate of Appointment, and within 90 days, submit an "Estate information Return" to the Ministry of Finance. The Return must include a breakdown of the fair market value of each asset owned by the deceased on the date of death, and a detailed description of the assets. This requires onerous appraisals and valuations, and the detailed collection of information. If the estate representation finds a mistake in the Return, a correction must be made within 30 days. The partial privatization of Hydro One will come with some big private sector-style paycheques. A preliminary prospectus for the initial public offering (IPO) released Friday notes the new CEO will be eligible for up to $4 million a year — $850,000 in base salary and $3.15 million in incentives. Finance Minister Charles Sousa and Energy Minister Bob Chiarelli defended the eye-popping payout which far surpasses any salary revealed in this year’s public sector Sunshine List. “Right now, the compensation’s comparable to other executives,” Sousa said, noting most of the money will come only if certain targets are achieved. Those targets include good dividends, a strong safety record and, most importantly, excellent customer service, Chiarelli said. NDP MPP Peter Tabuns, whose party opposes the sale, said the salary is the equivalent of winning the lottery. He predicted hydro prices will rise as the publicly owned Hydro One is sold off in chunks to the private sector. Chiarelli said Hydro One won’t set electricity rates, and he expects private sector discipline to keep costs under control at the utility. PC MPP Todd Smith said the total annual compensation for five executives at the revamped Hydro One will be $24 million. “This is all about paying huge, exorbitant salaries, pensions, severances, gold-plated pension plans to these big executives,” Smith said. An Unholy love affair: What is it between Wynne and the auto insurance industry in Ontario? Hard road for [Ontario] car crash victims: Why is the Ontario government taking away money they deserve and transferring it to the insurance industry? For the past five years the Ontario government has been taking steps to transfer money from victims of auto accidents to insurance companies. We’ve seen drastic decreases in no-fault accident benefits. To compound this, last month the Ontario government issued a regulation increasing deductibles that apply when people injured in auto accidents sue the person or persons who caused the accident. This was done quietly, without any debate or meaningful notice. These deductibles apply to accident victims who have suffered serious injuries and want to sue the at-fault driver or vehicle owner for negligence. Only victims who can establish they have suffered a “permanent serious impairment of an important physical, mental or psychological function” are entitled to sue to recover damages not covered by no-fault accident benefits. It isn’t easy to meet this threshold. Medical evidence must be provided. So these victims haven’t suffered minor or nuisance sorts of injuries but serious ones. Prior to the change in law last month, the Ontario government mandated that any pain and suffering damage award to an accident victim of $100,000 or less would be reduced by a deductible of $30,000. That amount is an arbitrary, made-up number that takes money out of the pockets of accident victims. For example, if a jury awards an accident victim $50,000 in damages, the judge will apply the deductible so that the insurance company only has to pay $20,000. Of course, jurors aren’t told about the existence of the deductible for fear they might bump up their awards. As of last month, the deductible has been increased to $36,540. So now the recipient of a $50,000 award will only receive $13,460. The recipient of a $100,000 award will only receive $63,460. There’s no other area of law where such a deductible applies. It only occurs in auto accident cases. To make matters worse, the Ontario government has also decided to increase the $100,000 threshold for the application of the deductible. TORONTO - There are so many candidates, it’s hard to pinpoint exactly which boondoggle caused us the most grief in our electricity bills. Premier Bob Rae’s NDP government used then-Ontario Hydro as a social program. His government proposed fighting greenhouse gases by investing in a Costa Rican rainforest and studying cow farts. Then there was the Homer Simpson moment, when it was revealed Ontario Hydro’s so-called dream team of four American nuclear energy experts turned out to be more of a nightmare for ratepayers. The Americans were paid close to $40 million for about four years’ work at the Pickering nuclear plant around 1997. But the boondoggle that really takes the cake is the mess created by former energy minister George Smitherman with his Green Energy Act (GEA). He got that right. The cost of electricity has soared. And we don’t do much business anymore because companies moved south to the U.S. and Mexico. He claimed the GEA would create 50,000 jobs — a claim later refuted in a scathing report by then-provincial auditor general Jim McCarter. In 2011, McCarter said the GEA was not just hiking the price of electricity, it was actually forcing us to generate more nuclear and gas-fired electricity — to back up unreliable renewables. And it didn’t produce jobs — it killed them. “Because renewable energy is very expensive, the impact of higher electricity prices on the other job sectors actually has resulted in a net loss of jobs,” McCarter said at that time. And he’s been proven absolutely correct. In her most recent report, auditor general Bonnie Lysyk painted a gloomy picture of how this government’s mismanagement of the energy sector has added billions to our bills. Lysyk estimated the so-called Global Adjustment (GA) — that’s 70% of your bill — cost us $654 million in 2006. In 2013, it gouged $7.7 billion from us. What did we get for this? We must be bursting with clean, green energy, right? According to the Independent Electricity System Operator (IESO) website, on Tuesday at 2 p.m. exactly 0.2% — (or 43 megawatts) of our electricity came from solar. A piddly 1.6% (326 MW) was from wind. The lion’s share of our generation — 55.6% — came from green, reliable nuclear energy. Good ol’ hydroelectric power — the only truly cheap green electricity — came in at 23.7% and gas-powered plants were at 18.5%. The hourly price of electricity was just 3.02 cents a kilowatt hour. And the GA? A whopping 9.67 cents a kWh — three times the cost of the hydro. But what we don’t understand is why the amount of fraud -- to hear it from the insurance companies -- never, ever, seems to decrease. As a convicted white-collar criminal, Queen’s Park proposed sale of a majority stake in Hydro One has sparked my interest. The proposal on the table is a con job of astronomical magnitude. Because it is a bad price. Investment people — like the people who have agreed to help Queen’s Park unload its majority stake in Hydro One — value companies based upon a couple of different factors. Sometimes the value of a company is based on the value of its assets: land, factories, intellectual property, and brand name recognition. The thinking being that better management of those assets might generate higher profits. Sometimes the value of a company is based on its profitability. A stable stream of income is worth paying good money for. Some companies are valued on their assets, others are valued on their earnings; sometimes it’s a little of both. Hydro One is a stable generator of profits. 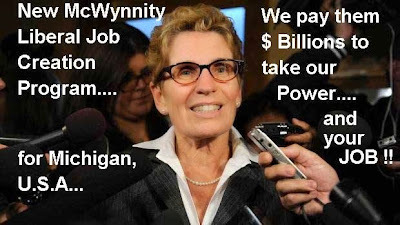 It has been profitable since it was created out of the breakup of Ontario Hydro. Its profits have grown 6.3 per cent per year for the last 14 years. It reported earnings of $749 million for 2014 — all of which belong to the people of Ontario. You and me. Now, we all know that the province is in debt. $284 billion. That’s the bad news. The good news is that investors love to buy government bonds. Investors are so eager to buy Ontario bonds that they compete as to who will accept the lowest interest rate. In March, bond investors lent Ontario money for 10 years at a rate of 2.1 per cent. Our average interest rate on all our existing debt is only 3.8 per cent (and falling). One way to calculate it is to say that $749 million pays all of the interest on $20 billion in existing government debt at a rate of 3.8 per cent. So, to accept anything less than $20 billion in cash is a bad deal. Another way is to say that $749 million will pay all of the interest on $36 billion of new government debt at a rate of 2.1 per cent. So, to accept anything less than $36 billion in cash is a bad deal. The number that doesn’t make sense is $15 billion. That’s the value that the premier has put on Hydro One. (If 60 per cent is worth $9 billion then 100 per cent is worth $15 billion). That is the number that Bay Street has convinced the Premier to accept for selling a profitable and growing business that earns $749 million with an earnings growth rate in excess of 6 per cent. I don’t know. But I can tell you why Bay Street is pushing this deal. Greed. In addition to buying a blue-chip electricity monopoly at a rock-bottom price they hope to make money by “underwriting” the deal. They intend to charge us a fee for selling our Hydro One to themselves at a terrible price. And a deal of this size could be worth hundreds of millions of dollars in fees. I have a lot of respect for investment bankers. They are the guys (mostly guys, anyway) who help companies “go public” by convincing ordinary Main Street investors to buy shares in newly public companies. That takes a lot of work and is not without some risk. What will not take a lot of work for them and involves no risk is selling Hydro One at a ridiculous, giveaway price. I am not an expert on whether or not Hydro One needs new management or if we would all be better served if Hydro One were not 100 per cent owned by the people of Ontario. But I do know that for $9 billion, the new shareholders should get somewhere around 30 per cent of the company, not 60 per cent. This deal is the biggest con I’ve ever seen. Keith M. Summers is a former hedge fund manager and was convicted of fraud in 2014. He is currently serving a three-year sentence. His book, Conned: How Wall Street Rips You Off and How to Fight Back will be published this fall. For New York and Michigan States. It's true. Energy producers have a guaranteed production capacity, and when it exceeds demand OPG sells off the surplus to New York and Michigan at very often below the cost of producution. This is what Chiarelli calls the "Walmart solution." Rn a political campaign without ever leaving the hose. My congratulations to Prime Minister Stephen Harper and the Conservative party; they’ve found an even better form of voter suppression than robocalls. They have refused to participate in the TV debates put on for every general election by Canada’s network television consortium since 1968 — back when voter turnout was north of 75 per cent. For the life of me, I don’t know why the PM blessed Maclean’s with the task of conducting the debate, when party spokesperson Kory Teneycke and the elite journalists of 24/7 were standing at the ready, fully funded by the taxpayers, to get the job done. I guess Steve didn’t want the 10 million viewers that CTV, Global and the CBC have to offer. 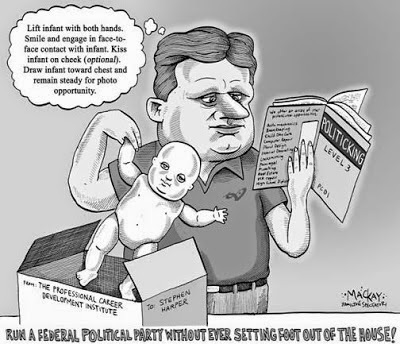 After all, a mass audience would only give his opponents a bigger opening to track for the entire nation the death spiral of democracy and the rule of law in Canada — to say nothing of the parody of Conservative ethical values the Harper regime now represents. Maybe that’s why Harper wanted a change of moderators. Steve Paikin earned a reputation as a fair and impartial moderator in the 2008 and 2011 debates. Maybe that was a problem. Or maybe it was the fact that his son, Zach, tried to run for the Liberals. The real reason for Harper’s sudden attack of cold feet is probably the Alberta election — which offered an object lesson in how a strong debate performance can change everything. Jim Prentice didn’t have enough spinners and fear-merchants to scupper the radiant sincerity of Rachel Notley. Martin was defeated by the Ad Sponsorship scandal, an elaborate kickback scheme that saw public money directed back to the Liberal party. Martin wore it even though he wasn’t involved. To his credit, and for all the right reasons, he assembled his own firing squad in the form of the Gomery Commission. For all the wrong reasons, Steve never called an inquiry into the robocalls scandal. Trust me — you will never see a boomerang leave Steve’s hands if he can help it. At the time Steve asked Martin that question about criminal investigations in 2006, the correct answer would have been “two”. If someone were to ask Steve the same question during the 2015 debate, he wouldn’t have enough fingers on both hands to compute the response. By my count, the Harper team has been the subject of at least 15 investigations. The stable which he was supposed to muck out has become a pigsty on his watch. The Conservatives cheated in the 2006 election. Criminal charges of improper election spending were dropped in March 2012 as part of a plea deal. The CPC pleaded guilty to exceeding election spending limits and submitting fraudulent election records. They chequebooked their way out of the slime — paying a $52,000 fine and then repaying a further $230,198. The PM’s former parliamentary secretary, Dean Del Mastro, has been convicted on three counts of election fraud arising out of the 2008 election. He is now facing the possibility of jail time. His cousin, David Del Mastro, is also facing charges related to the 2008 election. 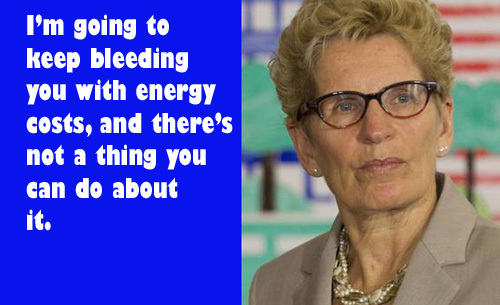 Does Premier Kathleen Wynne even believe the things she says? Do you? Perhaps she does, since she leads a province with a multiparty system that allows her to win a majority government with less than 40% of the vote. A province where she is the leader favoured by the bloated public sector unions, not to mention facing a weak opposition. And so, like the leader of some tin-pot dictatorship, perhaps Wynne hears nothing but the sound of her own voice and has come to believe it. On budget day last week, Wynne spoke with Ryan Doyle on Newstalk1010, were I work. She touted her, “sound fiscal management.” Beg pardon? Ontario’s debt is more than twice that of the state of California. But, of course, California has a larger economy than Ontario. When the Liberals took power in 2003, Ontario’s public debt was $138.8 billion. Now it’s $298.9 billion, a 115% increase. Wynne’s new budget is long on infrastructure spending, which is sorely needed, but short on details on where that money will come from. Unable to balance the budget, the Liberals have no money for debt retirement. “We remain attentive to the fact deficits have shown little progress in the past few years, and in fact have increased from 8.1% of revenues in 2012/13 to 9.2% in 2014/15”, noted Michael Yake, a Moody’s VP and lead analyst for the province of Ontario. That’s not as sunny an outlook as the one projected by the Wynne government. A casual dismissal of the private sector by Ontario’s premier is illustrative of her beliefs regarding business and competition. When Doyle asked about the new Ontario beer tax she’s imposing ($100 million annually) Wynne said we know from research if alcohol sales are privatized, prices goes up. The example most often used is Alberta. Except studies by the Fraser Institute disagree, which also show the number of outlets, varieties of beer available and employment increased. Indeed, looking to our southern neighbours, who are within easy driving distance of Queen’s Park, the cost of 30 cans of Labatt beer on special at Consumer’s Beverages in Buffalo, N.Y. is $19.99 this week. At The Beer Store in Ontario, 24 cans cost $46.50. Road trip, anyone? It isn’t the private sector that has driven the cost of alcohol through the proverbial roof, the government has. Basically, Wynne gives us bad fiscal management and a delusional view of how the private market works. 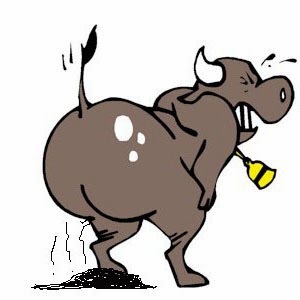 The individual or event mentioned in this blog has been awarded the infamous BULL POOH AWARD! Welcome to my blogs. For a more extensive profile, click on "About Gerry Burnie" (above).